Mourning the loss of five WorldVenture family members. UPDATE (Aug. 4): WorldVenture and the family of Jamison and Kathryne have created a memorial fund for those wishing to respond to the tragic death of the Pals family. Donations to this memorial fund will be used to make grants for future WorldVenture appointees’ outgoing expenses and thereby accelerating their departure for their missionary assignments. UPDATE (Aug. 3): A memorial service for Jamison, Kathryne, Ezra, Violet, and Calvin Pals will be held Saturday, Aug. 6, 2016 at Bethlehem Baptist Church (Downtown campus), in Minneapolis, Minn. The service will be live-streamed beginning at 11:30 a.m. CST. Following the Pals’ memorial service and luncheon at Bethlehem Baptist Church, there will be a brief WorldVenture gathering for any alumni, missionaries, appointees, staff, past and present board members attending. The gathering will be at Bethlehem Baptist Church, but the exact location will be determined later. •For God’s comfort and grace for Jamison’s parents Rick and Kathy Pals and their extended family, and for Kathryne’s parents Gordy and Nancy Engel and their extended family. Pray that relatives traveling internationally will be able to arrive for the memorial service on Saturday. •That many people (around the world and especially in Japan) will be drawn to Jesus as their Savior through the testimonies of Jamison and Kathryne and their families and friends in the midst of this tragedy. •That God will call many to rise up and take Jamison and Kathryne’s place in missions. 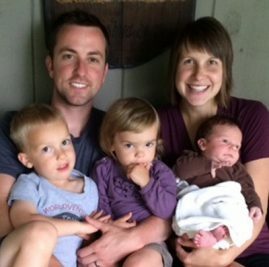 (Originally published Aug. 1): With great sorrow we share that WorldVenture appointees Jamison & Kathryne Pals, along with their three children, Ezra (3 yrs), Violet (23 mos), and Calvin (2 ½ mos), were killed in a multi-vehicle crash on Sunday, July 31. The Pals were traveling in their van from Minnesota to Colorado to participate in their final training before deploying to serve as missionaries in Japan, when their van was struck by a semitrailer truck in Nebraska. Jamison & Kathryne were committed to sharing the good news of Jesus. During their college days and more recently with their home church, Bethlehem Baptist Church of Minneapolis, MN, they served in local ministry and in several other international locations. While we sorrow in Jamison, Kathryne, Ezra, Violet, and Calvin’s deaths, we also look to the promise of the One, Jesus Christ, who rose from the dead, for He has prepared for them a place in heaven for their good and for the glory of Jesus Christ. Listen to an interview with WorldVenture’s Gwen Britton on Moody Radio about the Pals. The loss of this young family saddens me greatly. My heart is with them and all who love them. Being an EMS provider in a neighboring mutual aid community to that of Ogallala, Brule, and Big Springs, my heart also goes out to them. That kind of tragedy is hard for all involved. My prayers also go to the truck driver who made a fatal mistake and will now have to deal with that for the rest of his life. I'm so saddened by this tragic loss. I never knew the family but would like to take the time to offer my prayers and thoughts. Thank you, neighbors and first responders. I know the Pals family only through news of the accident -- and the mprnews.org link to their blog, begun last year as they prepared to go to Japan with the love of Jesus. I it long and deep with the love of God. I pray their lives through their words will work the love of God into many lives. We're heartbroken over this tragedy. Having served 11 years in Japan with Asian Access many years ago, we feel a special bond with all seeking to serve Christ there. Our prayers go out in behalf of their family, friends, and mission family. Our love and prayers go out to this caring, loving family who we got to know in their younger years as our delightful neighbors in Circle Pines, MN neighborhood. We are thankful for their example of love and family ties. We don't live far from where the accident happened and although we didn't know this family, Our thoughts and prayers are with their families and your community as you mourn the loss of this family! Yesterday, our daughter left to head back home from Lake McCounaghy. As she got to I80 there was a traffic jam,due to this accident, she called me and complained. She knows what happened and thanks God for allowing her to pass. We never know when God calls us home, but, these blessed disciples were covered in the love of Jesus to enter into eternal life. We pray for their families and friends. Praying for the families as they adjust to their grief and loss. May God use this event to bring others into the family of Faith. While I do not know this young family, my heart is broken. The world is a much lesser place without them. They are with the Lord now, and experiencing the peace that passes all understanding. My husband, two young girls, and I just arrived in Okinawa a week ago to serve as missionaries through a Christian school. Our hearts break for the families, and we will remember them as we share Christ to the Japanese in Okinawa. We will be praying for the family and friends and their sudden losses. Such a terrible tragedy but may God be Glorified and many brought to the Saving Knowledge of Jesus Christ through their loss and love. Only Christ knows why. Their lives is now a living testimony..the tragedy for us is God's greatness that his name be continually proclaimed. Sad that their call has ended that way. Many missionzries will arise. As aging missionaries in northern Hokkaido Japan, we are so disheartened to hear of the loss of someone headed to reach the people of Japan with the Gospel. But we too must rest in the fact that God's plan is greater than man's and we claim His promises and pray not only for the physical and spiritual family who lost so much but for many to still be reached by the desire they left behind. May others pick up the baton and carry it to Japan! This is so very sad. I don't know this family but will pray for their familes and friends who now have to deal with the loss and grief. To God be the glory. I'm so very sad about what happened to the Pals family. Although they never got where they intended to go, it sounds like they leave an amazing legacy. My church is sending a pastor family to Japan to do the work that the Pals will be doing. The passing of the Pals in this tragedy is indeed a mystery that we have to learn to accept by faith. The Lord in his wisdom will definitely turn this "bad" thing into "blessing" for His glory. Pastor Lam, Thank you for sending another pastor to Japan to reach the Unreached, in obedience to the Great Commission. This is such a horrific tragedy ! My heartbreaks for all the family and friends. I am so sorry!!! My heart goes out to the families and friends! I pray that you all will be of hope that they were so loved and are rejoicing before their Savior and Lord Jesus Christ for they so loved him and wanted to lead people to their Savior. What a great faith they had to bring others to Christ. May others come to the Lord and be saved. May the Holy Spirit move in your lives and bring you help encouragement strength and comfort. My thoughts and prayers go out to this beautiful family. Praying for friends and family along with all of you at World Venture. My husband and I were traveling home to Colorado from Omaha on Sunday and were in the traffic that followed this horrible accident. This family has been on my mind ever since. My deepest thoughts and prayers go out to all the friends and family of the Pals'. I didn't know them, but it sounds like they were an amazing family who God shined through. Our prayers their family and your mission. I am so speechless and saddened by this news. I don't understand why these beautiful people were taken away from the Earth. Oh, God, Jesus, please help me! Please comfort their families, Lord! Prayers and thoughts are with the remaining families affected by this tragedy, including the other gentleman who passed. Our times are in God's hands. He is a wonderful God to allow them to enter into eternal life together. We are terribly saddened to learn this news, tragic from our human viewpoint. The quote from Piper is so true! Jim Elliott's oft-quoted statement, after he gave his life along with four other young missionaires in Ecuador, comes to mind. We pray for the families of Jamison and Kathryne, for their church and for the World Venture family. We know that God will glorify Himself even through human tragedy. Although I dont know the family, I am deeply saddened by their loss. Such a tragic accident claiming this young families life breaks my heart. Prayers to the family members and friends that have been left behind. Not only praying for them and the ministry, but for the families of this precious family. As a great-grandmom, my heart cries out for comfort for all involved. This hits close to home! My mother-in-law lost her mother, father, 2 young sisters and a little brother when she was just 23. My son just passed away 3.9.2012 at the age of 23 from an accident, and all 6 are buried together. It's a tough road even having the Lord by your side. Grief is messy and it hurts. My heart grieves along side this family! You are not alone! My family grieves with the Pals and Engels family over the loss of Jamison, Kathryn, Ezra, Violet and Calvin. I had the privilege of working briefly with Jamison at FMSC and had the chance to meet him, Kathryn and Ezra a couple of years ago. He was a man of quiet strength and a clear heart for the Lord and for serving Him in whatever capacity he was called to. I also had the privilege of attending the funeral via lifestream--my wife and I were blessed at the honor paid to the family and extended family and friends as well as the message of hope in Jesus we all share. We continue to pray for all who knew the precious Pals family--for peace, comfort and an overwhelming outpouring of His presence. My Peterbilt was in the repair shop in Ogalala on the Sunday of the accident; the vehicles were towed to the lot across the street. Every day, for 5 weeks I would see the Pals van. Such a tragic loss and so young. My thoughts and prayers .... Such a beautiful family........ . . . . .